Bill Hudson and pedigree reader Dale Hunt smile for the camera before the 2016 Hudson Valentine Sale in Bowling Green, KY. 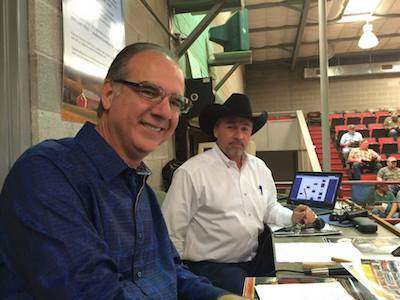 This sale utilized Hired Hand Live for many years before its final Bowling Green sale in 2017. Hired Hand Live prides itself on being FREE to use for the viewers, bidders and buyers. No account is needed to watch. Sign up for a bidders number here. If you're a sale organizer who would like to add Hired Hand Live to your schedule please inquire about the cost here. We charge every Longhorn sale the same affordable flat-rate fee. No commission is taken. A discount is offered to those sales which utilize our services multiple times per year.